This is probably not the first work by Harlan Ellison. The man wrote thousands—I assume thousands—of short stories and, even though I have never been much of a sci fi reader, there’s a good chance that at some point I read something by Ellison. And so have you. 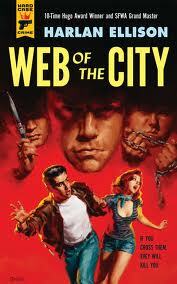 Web of the City is his first novel, released in 1957. The publisher quickly folded and the book disappeared from the paperback racks. Until 1960, when it was republished as Rumble—without the author’s knowledge, as he relates in the introduction to the new edition. Here's the plot: Young tough Rusty Santoro quits the Cougars, the gang he once led, to focus on drafting. The gang's new prez, Candle, wants to prove his mettle by stabbing Rusty. There's a horrible murder, some revenge, the drugs business. That's about it. Ellison was apparently committed to this story—even briefly joining a Brooklyn street gang as part of researching the novel. This experience partially comes through in Web of the City: there’s an ugliness to the book that feels much more realistic than the gang world portrayed by Hollywood during the same period. I suspect that Ellison got the period’s lingo down pretty well, since the characters use slang that I’ve never heard before. Then again, everything I know about gang culture of the 1950s I learned from two episodes of Mystery Science Theater 3000. I must take issue with .Ellison’s depiction of drug use. Here, I want to stress that this is a tempered criticism, given the author’s youth when he wrote this. But I do have to wonder if he had actually seen anybody smoking marijuana, as his depiction of Rusty’s night of tea-fueled mayhem seems more reminiscent of Reefer Madness than a chill Sunday afternoon. I know for a fact that marijuana in the early ‘90s was far less potent than today’s weed. So, my guess is that smoking a joint in the fifties probably had the affect one gets from standing up very fast. But is the book good? I found it initially difficult to get through. There’s a wordiness in the book that slows down the reading considerably—an effect, no doubt, of Ellison’s relative inexperience as a writer at the time. The book gets much better when we finally get to the dramatic turning point, the murder. Unfortunately, this is around page 100 or a 200 page book. The revenge plot is standard, the drug bit laughable. That being said, Ellison crafts the angst-ridden Rusty Santoro rather well. He comes off as a far more complex individual than the characters that populated the world of crime fiction of the era. I preferred, however, the short stories included in the edition. Well, two of them. The first, “No Way Out,” being the original upon which Web of the City was based was largely unnecessary. But “No Game for Children” and “Stand Still or Die!” were wonderfully fun stories, though maybe it’s because, like any good citizen, I like to see nogoodnik punk teens get theirs. Perhaps Hard Case will republish Ellison’s 1958 collection The Deadly Streets? My guess is that I would enjoy it far more than Web of the City.